“Shikyu” is the Japanese word for a womb. “Shikyu-chan” (small womb, “Womby”) was created to remind us how life begins, and how life should be, accepting with no questions or barriers. The Shikyu-chan gently cradles the Earth (“Chikyu” in Japanese language) in arms protecting and nurturing all life within. 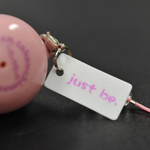 This is not just a cute toy, but a Self Help Item that helps us to calm down and relax in any stressful situation. The smooth surface of The Shiku-chan has been chosen as the most natural and comfortable when held in the palm of ones hand. Try to gently grip the Shikyu-chan. It could take 30 to 60 minutes before holding it no longer feels foreign and you will be embraced in harmony. One of the important features of the human body is its ability to determine what is of the self and what is ‘foreign’ to it. Yet the body does not always reject things from the outside. The uterus (womb) is the one exceptional organ within the human body that does not discriminate between the own and foreign cells. A fertilized egg may be welcomed into the uterine environment regardless of DNA, nationality, race or religion, even when fertilization is through surrogacy. During the course of development of a fetus, touch is the first sense to be felt. Of all the senses, the touch is what reminds us that we are not alone and we do exist on the earth with other beings. Every human life on the earth is enveloped in the warm embrace of their mother’s womb. Can we perhaps learn from the ways of the womb and apply it in dealing with conflict? Instead of giving up, ignoring, arguing, or using force, why not try accepting others as they are? It is not the same as compromising or suppressing one’s desires. It’s simply not to negate the other. When we master the art of acceptance a better understanding of life will begin to take place. We can find the will to start over, connect, and be at peace by getting the way of womb sensatio, whan both the mother and child been as the one. Everything starts from here: Who we Are, How we Are, The Way we Are. Accept yourself and JUST BE AS YOU ARE !